Ganpati festival is here and we all know Bappa's favorite is Modak. Many varieties of traditional and fusion Modaks are made these days. Though all time favorite is this fried or तळणीचे Modak. 2. Add maida in a bowl. Add salt and mix well. 3. Heat 2 tbsp oil and add hot oil to maida. With help of a spoon, mix well. Rub the oil and maida together with hands such that the mix resembles breadcrumbs. 4. Now slowly add milk-sugar-water mix to knead tight dough. 5. Cover and keep the dough for resting for 15-20 mins. 6. To make filling, powder the remaining sugar using grinder. Add coconut powder to powdered sugar. Add kishmish and mix together. Keep aside. 7. Now roll maida dough into thin chapati. Cut into 4 poories using round cutter or a lid. 8. Add a tbsp of coconut filling to each poori and give a shape of modak. 9. Make remaining modak same way. 10. Heat oil in kadhai and as its.completely hot fry 2-3 modak at a time on low flame strring as needed. Fry on low flame only to ensure modak don't turn soft after frying. 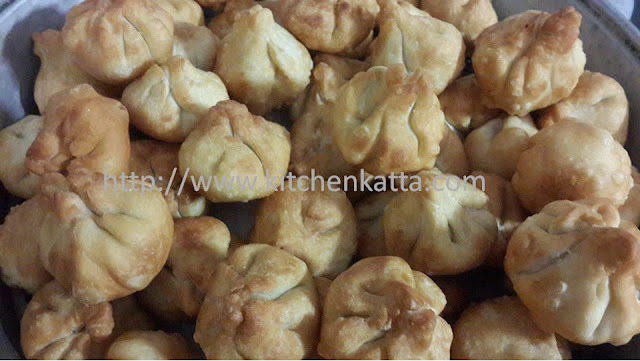 Your fried Modak Prasad is ready! I have never tried making Modak, I might try my hands at this. Sure Manjulika,do try and share how you like it!! Thank you for visiting!